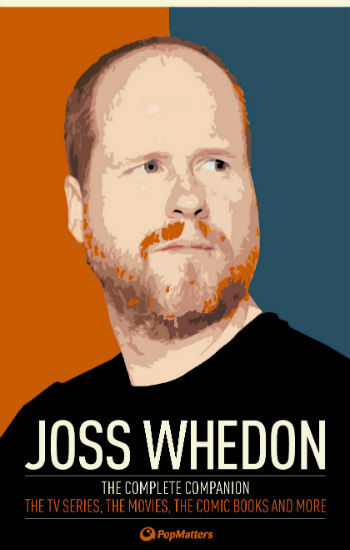 Edited by Mary Alice Money, who lives just a short drive from me and teaches at nearby Gordon College in Barnesville, Ga., The Complete Companion is a… well, a compendium of articles taken mostly from PopMatters’s April 2011 celebration of Joss Whedon. Organized in order, from Buffy through The Avengers and containing no fewer than three articles on each of Whedon’s works, Money has assembled a true tour-de-force of information on any Whedony project readers could consider. Buffy (and, by extension, many of Whedon’s other projects) have become topics of academic study at universities around the nation. There’s an academic journal (Slayage, the online Journal of Whedon Studies) and an associated conference. Whedon’s work shows up in academic culture, pop culture, and even the linguistic vernacular — and all of these are addressed in the book. This is all well and good, but it’s not what I signed up for. What did I want from The Complete Companion? Well, I’m not an academic. Not anymore. I was, once, but now I’m nothing but a fan with an academic background and a master’s degree. While it’s important that studies of feminism, popular culture, and linguistics are important, that’s not what I’m interested in reading. I’m not saying there was nothing for me in The Complete Companion. There are interviews with Alexis Denisof (“Wesley”, “Senator Perrin”), Brian Lynch (from the Angel comics), and Tim Minear (from many Whedon projects); there are framing pieces on each of Whedon’s works, which were certainly interesting; and there were several pieces on fan culture and the “sausage-making” process of several of them. I was really hoping for more of that — not necessarily tell-all, behind-the-scenes content (although that would certainly be cool to read), but more about what the authors and auteurs were thinking when they wrote and created the shows and comics I enjoyed so much. There just wasn’t enough of that. One of the problems with an essay compendium is that each essay is a stand-alone piece — either written independently for PopMatters or adapted for this volume from the academic journals in which they first appeared. That means each writer has to frame the work with an introductory section about the media being examined. This gets repetitive. Quickly. In the section about Buffy, which spans sixteen essays, I read way too much introduction and I found myself skimming. And then I found myself skimming articles as well. I also haven’t finished watching Angel yet, and a lot of the second part — which focused on that show — covered the fifth season. It’s not like I didn’t know what happened at the end of the show*, but now I’ve seen the finale examined in several different ways. It’s not so much a spoiler as a “okay, there’s really no surprise left at all” — academia has that effect. And then, in the section about comics (probably my favorite section because it contained the most sausage-making), Angel: After the Fall (Whedon’s canonical continuation of the television series) was completely summarized and dissected. I do have digital versions of the comic, and I’ll still read them after I finish the show (I have about 13 episodes to go), but some of the mystery has been taken out. Again, I knew more or less what happened, but now I know everything. I suppose that’s my fault. So, if you’re interested in the academic interpretations of Whedon’s work — feminist themes in Buffy, Dollhouse-as-metaphor-for-network-television, parallels between Alien Resurrection and Buffy, and similar articles, you’ll be thrilled. But if you’re looking for the kind of articles you might read on io9 or collected by WhedonQueen101 (formerly BuffyQuotes101 until yesterday or so), you won’t find them in The Complete Companion. It’s just not that kind of book. There’s definitely a place for the articles in this book, and also a definite place for books like this one. Maybe the place for them is on your digital bookshelf. Unfortunately, you won’t find a place for them on mine. Note to Parents: This book is a work of non-fiction and generally contains very little objectionable material outside of occasional quotes containing strong language from the various Whedon shows and films. It is safe to read for almost anyone over the age of eleven, although younger teens might be bored by it. Of course, you should use your own best judgment when it comes to your children. * Mostly through fanfic. Stop laughing.